If you could choose your ideal living situation, what springs to mind straight away? For me, it would have to be dogs, dogs, and more dogs. Forget about the fancy furniture or the perfect views, surrounding yourself with pups is clearly the right thing to do. And if you think otherwise, you’re wrong. 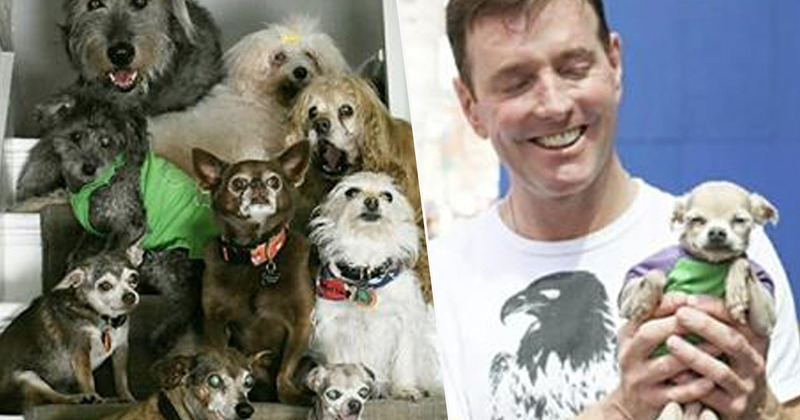 One man who clearly has the right idea is Steve Greig, from Colorado, US, who’s so far taken in 10 ‘unadoptable’ senior dogs from shelters, while spending his days taking care of the lovable bunch. It’s common knowledge senior dogs often get overlooked in shelters, with the RSPCA saying figures nationally show it takes nearly three times longer for older animals to be re-homed. With couples and families often wanting a pet they can spend many years with, senior dogs can get left behind with puppies taking the limelight. However, Greig wanted to put an end to this. The animal lover, who’s also an accountant, has had a fondness for animals ever since he was younger and has been surrounded by pets his entire life. I grew up with a lot of pets. Both my parents were animal lovers and they pretty much always let me have whatever I wanted as long as I could take care of it. As he grew up, his love of animals only grew stronger and upon getting his own house, he would always have three or four dogs around. However, one dog’s death affected Greig so much he found himself ‘distraught’ by it. After a few months of feeling terrible, he decided to do something ‘good’ which might not have necessarily happened before his pet died. I was just so distraught about [that death]. A month or two went by and I still felt so horrible about it. I decided that the only way I would feel better was if something something good happened that probably wouldn’t have happened if he had not died. And so he decided to make a visit to his local shelter, where he would adopt the ‘least adoptable’ dog and give the animal a forever home. As I get older, Christmases become a little quieter and the most unexpected things can have true meaning. On Christmas eve I returned home from church and a package had been delivered from Europe without a return receipt address, Germany probably by the lettering on the box. Inside was the sweetest letter, an old book about a little dog named Gyp and a delicate glass Christmas ornament in the shape of a Dachshund. It was a gorgeous letter mostly about gratitude and how this person wrestled with sending me the ornament because it would probably get broken during the trip. My favorite part of the letter was how they decided to send it anyway because "I was the type of person who would like it even if it was broken". ❤ The letter was only signed with the letter H. Whoever you are, your letter touched my heart deeply and made my Christmas very special. The ornament arrived safely. But you were correct, I would have loved it even if it had been broken. Merry Christmas. Greig’s way of thinking was, even if his own pet had passed away, he could still give another dog a good life. And that’s exactly what he did. So [I adopted] a 12-year-old Chihuahua [named Eeyore] with a heart murmur and four bad knees and I brought him home and that was just the beginning of all the animals. They’re [senior dogs] just wiser animals. You kind of know what you want out of life once you become a certain age. These dogs know who they are and it’s easy to develop a relationship with a person or pet who knows who they are. Since then, the number of dogs he’s adopted has risen to eight – the other two are his sister’s and his roommate’s, whom he looks after. Regardless, they’re all a massive deal on Instagram. Each day, Greig makes 10 doggie breakfasts (most of whom have completely different diets) before giving medication to the seniors who have health problems. He then goes to work, but returns home at lunchtime to walk the pack. And it isn’t just dogs who live with Greig; the animal lover also has a pig called Bikini (who thinks she’s a dog), two chickens, two ducks, two pigeons, a couple of cats, a rabbit, and a pond full of koi. Phew. Well, it’s clear from this story that Steve is a hero who needs protecting at all costs.